Dear Guest PLEASE BE ADVISED SHOULD YOU HAVE ANY DIFFICULTY BOOKING ONLINE you can either complete the website enquiry form or email us direct:- stay@cartref-abderdovey.co.uk In the event of this happening we apologise for any inconvenience. 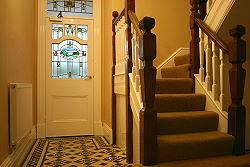 Cartref Guest House limits bookings to 2 or more days. 3 Sup king/Twin limits bookings to 2 or more days. Lovely rooms. Fantastic service. Brilliant breakfast. Excellent location close to village, golf course and railway station. Linda and Mike are lovely hosts that always do the little extra. Have returned every year since 2010 and will continue to do so. Dear JF Thank you for your excellent Review. We look forward to welcoming you back next year.